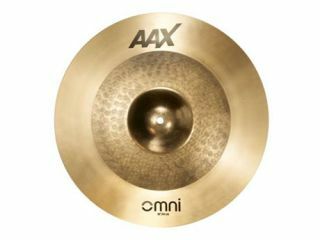 NAMM 2011 PRESS RELEASE: Not a crash, not a ride, OMNI is a revolutionary new cymbal from innovative Cymbal-maker Sabian. Developed for the astonishing Jojo Mayer, the vision for OMNI was to create a cymbal with outstanding sonic contrast both when played on its own or with other cymbals. This ambitious goal required a radical rethink of the architecture and construction of a cymbal. "Our 30 years of innovative cymbal making really served us well here," says Master Product Specialist Mark Love. "OMNI was a challenging process, but in the end we couldn't be happier with the result." A medium-weight centre in brilliant finish, and an extra-thin, natural finish edge make for a cymbal that's striking in appearance. But it's the highly musical tone structure and careful balance of frequency that enable this cymbal to sit so well in any musical setting. "For me, this opens up a whole new approach to playing cymbals," says seminal artist Jojo Mayer. "Never has so much sonic versatility existed in just one cymbal. This is a go-anywhere, play-anywhere cymbal, and ultimately, you can play any gig with just this one cymbal on your kit." Available in 18" and 22" models, OMNI is the latest cymbal innovation from Sabian, and it's covered by the Sabian two-year warranty.